What's like the best option to export file from Daz to Carrara pro8? 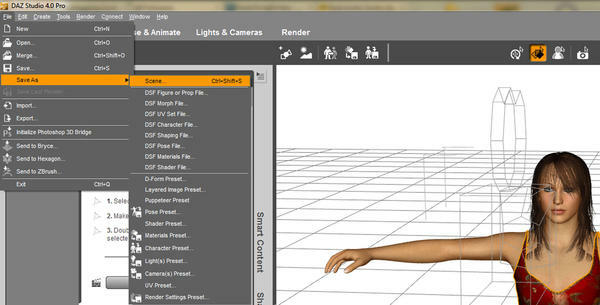 Today I just wanted to export figure with clothe&hair; from Daz to Carrara (as COLLADA file)but during that process I get only errors... What's like the best file format for Daz figures?? For Carrara 8.5, the best way that I know of is to save as a duf character or scene. In 8.5 if you open a DS 4.6 duf Carrara brings in everything - lights, cameras etc also if your figure has a lot of morphs you may have to do some tweaking otherwise it works pretty good. If it's a scene you've made in Daz Studio, and you want that in Carrara,. ... Save the DS Scene as a DUF format, and Carrara 8.5 will open that. The best work-flow is to Begin by loading the Content (figures models etc) into the program you want to work with,. Carrara has always had the ability to load "Content" directly from the Browser window,. whether that content was originally designed to be used in Carrara, or Poser, or Daz Studio, or most other 3D model formats. So,. you can Open Carrara, Load your figures and props from the Content browser, or Smart content browser. There is no such thing like: DUF format - option on the list: save file as... in DAZ Studio 4 or maybe I'm blind? By the way: what does it mean a DUF shortcut?? You are using an older version of DAZ Studio, before the DUF file format was first used. You would need to upgrade to at least DS4.5 to see that. The latest version of DAZ Studio is 4.6.2.118 and should be available from your My Account > Product Library area. Carrara 8.5 is the 32 bit version, 8.5 pro is the 64 bit version, as shown in the product library. Just use the carrara pro serial number to get the pro features for the 32 bit version. Just to be clear, if you bought 8.5 Pro, you should have the 64 bit version and the 32 bit standard version in the account to download? Also entering the Pro serial number into the Standard 32 bit version unlocks the Pro features in the 32 bit Carrara? Sorry, was my explanation a bit garbled, I guess it has something to do with the half bottle of wine, my half of the bottle I just shared with himself. Not garbled. I just thought a bit more info. would help. If all goes well over the next few weeks, I may be able to get C8.5 myself. Ah good. I am glad it wasn't the fault of the wine. We rarely drink nowadays because himself is on warfarin and alcohol is not recommended as an accompaniment to his daily dose of rat poison, but we do like to have a couple or 3 glasses of wine after Sunday Dinner, is our weekly treat.